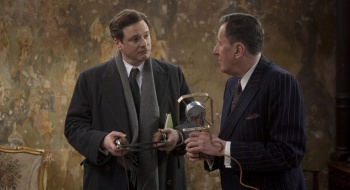 The King's Speech may get bleeps, in lieu of cuts, in order to obtain a more family-friendly rating. The King's Speech producer Harvey Weinstein wants a PG-13 rating to broaden the Oscar-nominated film's potential audience. The film's stars and director are adamant against any new cuts, which would excise chunks of one expletive-filled scene. Star Geoffrey Rush told The Hollywood Reporter that the curses in question are used "almost like a tongue-twister. It's gobbledygook. But it's not aggressive, it's not offensive. It's not harmful. They should just 'bleep' it. If you cut it, then you're going cut one of the key thrills of the film." It sounds like director Tom Hooper might be taking that suggestion into consideration. Talking to Entertainment Weekly, Hooper suggested that he may be looking at bleeping as a method of censorship, saying "I wouldn't support cutting the film in any way. I think we looked at whether it's possible to bleep out the f--s and stuff, but I'm not going to actually cut that part," further clarifying, "I'm not going to cut the film." He has not yet made a conclusive statement on the bleeps, and the Weinstein company has not commented on this latest development. Helena Bonham Carter spoke to EW as well, arguing, "I don't think it needs to be cut down. I think every 13-year-old knows [the words], I think every 8-year-old [does]." The use of these words in the context presented in the film is certainly much less colorful than what I heard on the playground at age eight, that's for certain.